Entity One Gel Technology, the only gel system to encapsulate nanotechnology within the nail enhancement, is making it easier than ever to create nails that are durable, glossy, naturally beautiful and second to none. 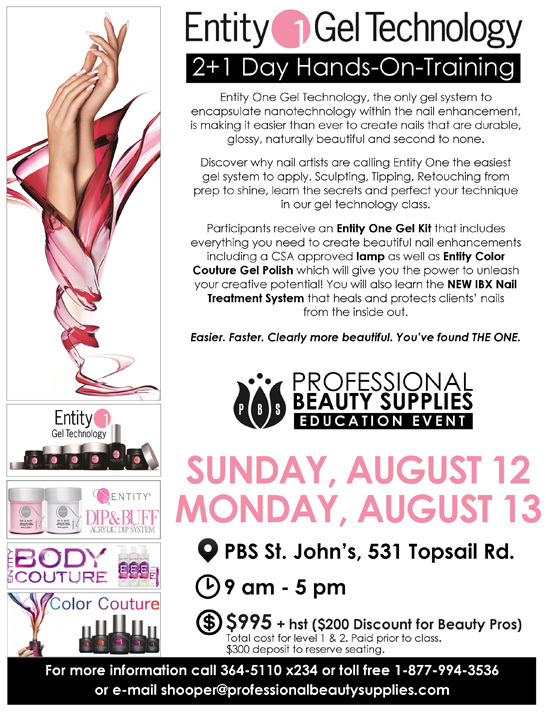 Discover why nail artists are calling Entity One the easiest gel system to apply. Sculpting, Tipping, Retouching from prep to shine, learn the secrets and perfect your technique in our gel technology class. Participants receive an Entity One Gel Kit that includes everything you need to create beautiful nail enhancements including a CSA approved LED lamp as well as Entity Color Couture Gel Polish which will give you the power to unleash your creative potential! You will also learn the NEW IBX Nail Treatment System that heals and protects clients' nails from the inside out. Easier. Faster. Clearly more beautiful. You've found the one. Preview the NEW Milk_Shake Colour Line!